Aspen is a great town. Its uniqueness extends beyond its spectacular geography to its amenities, people and community spirit. It’s a world-class, year-round Rocky Mountain resort offering great food, music, skiing, shopping – great everything – right in the middle of a real, functioning, small American community. It’s no surprise people like it, want to keep it going. And not just the good, smart people who live in Aspen full-time and those who own second homes there (including some of the wealthiest people on Earth), but the thousands of good, smart people who visit every year to address big issues at the Aspen Institute and numerous other forums. These include elites of American arts, sciences, politics and economics with amazing amounts of brainpower and money at their disposal. But geographic realities plus inexorable economic, demographic, and social trends are conspiring against the best of intentions. The future of Aspen – playground to the smart, rich and famous – may soon become untenable. The financial crisis dominates thinking now. Could it be the catalyst that signals the beginning of the end of business as usual: the start of a major, long-term and permanent change? The list of interested parties includes a wide cross section of year-round residents, second homeowners, business and property owners, public officials, visitors, employers and employees, builders and construction companies, managers and personnel at SkiCo (the town's largest employer). I have both personal and professional interests in trends in Aspen, and have been fortunate to visit many times and spend considerable time there over the past 35 years. My in-laws have been gracious and generous hosts (how lucky is that? ), and in my role as an analyst of economic and demographic trends, I have been invited to speak, make presentations and attend seminars on many occasions (I always accept!). Over the years I have personally seen the transformation from funky (I think the first time I skied there was in jeans and a sweatshirt) to glam and chic. To me it has always posed the classic development problem: how do you both improve and preserve what you've got, without setting forces in motion that undermine what you were trying to protect? 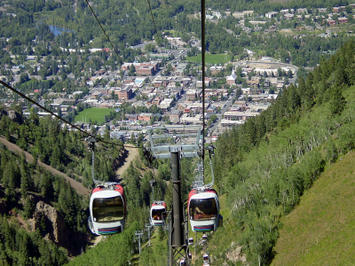 Before the housing and economic meltdown Aspen’s future was considered in State of the Aspen Area 2008, a report commissioned by the Aspen City Council and Pitkin County Board of Commissioners to provide guidance for future decisions on issues ranging from housing to growth management to transportation. The goal was to generate a 10-year community vision for the future, but that future may have to be put on hold. The report highlighted several trends that seemed to pose serious challenges for Aspen. Most prominently, it suggested that the Aspen economy was becoming dangerously dependent on real estate and construction, as opposed to the original drivers of skiing, lodging and retail/restaurants. There were many new jobs, but a decrease in available housing for workers. Aspen backs up to the Continental divide (closed all winter)! The Roaring Fork Valley is steep and narrow. Low- and middle-income workers must all live and commute “down valley.” But down-valley communities, where one used to be able to find cheap housing, have themselves become too crowded and expensive. On top of this the Roaring Fork Valley has moved within sight of being "built out." Traffic congestion is expanding up and down the valley (there is only one road – Route 82 – to get in or out of town), reaching intolerable levels during rush hours which start earlier and end later. A population of primary and second homeowners increasingly "aging in place" (with large percentages intending to retire in place), taking both their labor and residences off the market, exacerbate existing housing/lodging/worker imbalances. The only reason the town "works" now is massive cross-subsidization. The fabulously wealthy subsidize the town budget with high property taxes on their mansions (even though some are in residence only a few weeks a year). They also subsidize the many arts, cultural attractions and charities so ubiquitous to Aspen as well as a range of services for year-round residents, from child care to education, health services, senior services, and police and fire departments. Revenues from the rich and ultra-rich also pay for a town government that has a budget of $100 million plus for a town of 6000 permanent residents. In other words, Aspen could not afford itself if it had to rely on itself. Yet it was assumed the system would continue to work indefinitely because of the belief that "there will always be [a need for] an Aspen," a playground for the ultra wealthy who spent freely and gave generously. The burst of the housing bubble, and now the financial and economic crisis, throw that assumption into doubt. Even before the financial meltdown, the usual source of funds – more building to generate more fees, and/or raising taxes on visitors and residents (those both full-time and part-time) – were reaching limits. Now many construction projects have come to a virtual halt; it is no longer certain there will be buyers or a market for the completed structures – developers need to stop bleeding cash immediately. The value of building permits issued in Aspen this year is down 47 percent through Dec. 10. Meanwhile the all-important non-profit sector has fallen into a tailspin. Contributions to the arts and other charities are primed to plummet. Endowment funds have lost millions. Sales tax revenue, which is the main tax source, will soon crash due to decreased tourism. Visitor reservations are dramatically down this Holiday season; retail stores are posting "Help Not Wanted" signs. As a result, Aspen, a city unused to troubles, now has about all it can handle. Budget cuts threaten to cause havoc. Cuts in services, both governmental and those subsidized directly by the wealthy patrons, seem inevitable. Conflicts among elected officials, business, full- and part-time citizens could get ugly. Of course, there is always the possibility that Aspen will weather the storm: after one or two down seasons at most, the number of visitors and dollars collected, spent and donated will resume their inexorable rise. After all, the ultra rich, trendy and connected will always need a playground. The problems listed above are not impervious to solutions; those bridges will be crossed when encountered by lots of brainpower and money. In addition, not everyone is alarmed by the economic crisis and housing crash; some Aspen residents are indeed rooting for it, welcoming a lull in the constant construction, development and traffic, and hoping a slowdown will ameliorate such problems as the housing and worker shortages. Fiscal constraints will also bring some sanity back to (what they feel has been) the town government's extravagance. Long, slow decline is certainly possible: less spending, fewer visits, tax receipts, and charitable contributions could unravel the entire structure of cross-subsidization. Could it mean a reversion to the "old Aspen," the laid-back, counterculture, easy-going, hippy-dippy, live-off-the-land Aspen? Maybe so. But perhaps Aspen is facing systemic problems that can not be easily solved. Obviously, there are a great many demands on the area's land, people, government and businesses. There has never been a consensus in Aspen that growth and development are desirable, even though the town has been dependent upon them. Now that certain limits are within sight of being reached, the already politicized town could become even more polarized. The city government has always been composed and supported by year-round local residents, of course, who have always had a love/hate relationship with growth and development: the tourists and wealthy second homeowners bring the city great wherewithal, but they also bring great demands on the area's carrying capacity and inevitably change the character of the place. Of course, these conflicts have always existed, but as the stakes and money involved have grown, they have become more intense. It's going to be an interesting next few years. See you at the Nell. Dr. Roger Selbert is a business futurist and trend guy. He publishes Growth Strategies, a newsletter on economic, social and demographic trends, and is a professional public speaker. Roger is US economic analyst for the Institute for Business Cycle Analysis in Copenhagen, and North American agent for its US Consumer Demand Index. Submitted by sally on Tue, 06/21/2011 - 02:29. I don't think Aspen is that fragile after all, let's not forget it's a very notorious touristic area and it's mainly targeted by upper class tourists. I am not familiar with the hotel checking rates in the area but I know people who were willing to put considerable financial efforts to spend a vacation there. I prefer Roanoke hotels for this summer but I wouldn't refuse the chance to go to Aspen neither. Submitted by mmm on Wed, 01/14/2009 - 17:30. Mr. Selbert, have you been coming to Aspen for 35 years and not heard of the city's employee housing program? This sentence--"Low- and middle-income workers must all live and commute “down valley"...."--would suggest that to be the case. However, Aspen has one of the most aggressive employee-housing programs in the country. City planners come from all over the world (literally: New Zealand, Israel, mountain resort towns throughout the West) to copy it. Most of your analysis of Aspen is correct. But your omission of, or ignorance of, Aspen's employee housing program is significant. I think the largest danger to Aspen is "trendy"
Submitted by davebarnes on Mon, 12/22/2008 - 12:04. Aspen is one of THE places to be. What happens if it becomes not one? The very rich (those who occupy their houses for only a few weeks a year) could simply abandon Aspen overnight and flit off to [insert placename here]. Submitted by RobbyDesmond on Thu, 11/25/2010 - 22:11. I don't think that the financial crisis will ever affect the playground of the rich. In a financial crisis, it's not the rich that go bankrupt, it's the middle and small entrepreneurs. The rich and famous will still want to go skiing and partying in the Aspen even when the financial crisis will be at it's worst.